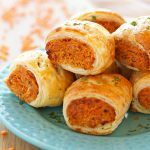 These Vegetarian Red Lentil Sausage Rolls are the perfect vegetarian appetizer! You won't even miss the meat! To the bowl of your food processor (or high powered blendeadd the cooked lentils, roasted red peppers (stems, seeds and skin removed), garlic, parsley, paprika, cayenne, ground fennel and sea salt and pepper. Process or blend until smooth, making sure to scrape down the sides so all the ingredients are incorporated. Transfer the mixture to a large bowl and add the shredded cheese and the breadcrumbs. Mix everything together well with a wooden spoon or rubber spatula until the breadcrumbs and the cheese are evenly distributed. Divide the mixture into 3 equal pieces and roll each piece into a long, thin sausage shape the same length as the width of your puff pastry sheet. Wrap each piece tightly in plastic wrap and refrigerate for at least 2 hours (refrigerating overnight also works well!). After your filling has sufficiently chilled, remove it from the fridge and preheat your oven to 425 degrees Fahrenheit. Unroll your puff pastry and slice it into 3 pieces to wrap around the rolls of lentil filling you've made. Wrap each piece of filling in puff pastry, making sure the seams are on the underside of the large rolls you're creating. Slice each of the 3 long rolls into smaller 1 to 1 1/2 inch pieces and place the pieces on a baking sheet lined with baking paper (parchment paper). You'll end up with about 15-18 pieces. Use a sharp knife to cut one or two small vents in the top of each mini sausage roll. Combine the egg and water in a small bowl and whisk together until frothy. Brush a small amount of egg was over the top of each sausage roll. Bake at 425 degrees Fahrenheit for 20-23 minutes, or until the puff pastry is golden brown.